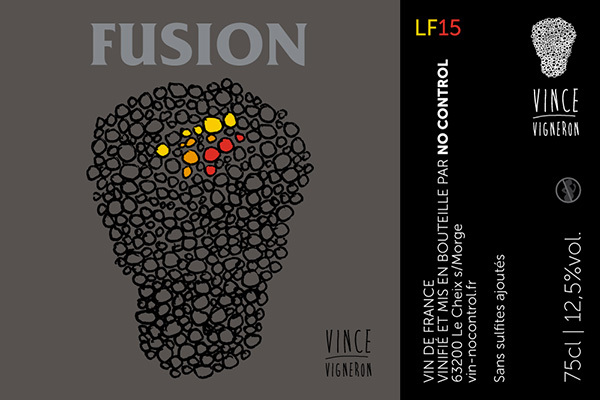 No Control - Fusion - Red wine produced in Volvic, les Crosses. This cuvée is named after the name of a music style which I very much like for its mixing of hip-hop and energetic rock. My favorite bands are Rage Against The Machine (of course), Faith No More, Suicidal Tendencies, Body Count. Regarding wine, it is also the fusion between gamay said from Auvergne and gamay said from Beaujolais and between two types of vinification. Located in Volvic. Soil : feldspathic sand. From 15 to 110 years old. Whole bunches in 2 fibreglass vats. First vat: grape trampling to make space in the vat and maceration of whole bunches in the juice. Second vat: carbonic maceration. Devatting, pressing, blending of both vats with the free-run and pressed juice. Maceration of 3 weeks. No added chemical inputs. Half of the wine in a vat, the other half in a 15 hl cask for 8 month.